Had Pride and Prejudice's Elizabeth and Jane Bennet or Sense and Sensibility's Marianne and Elinor Dashwood not ended up wedded or betrothed at the end of Jane Austen's classic novels, chances are they would've become very good friends with the senior spinsters in PBS and BBC's adaptation of three books by Elizabeth Gaskell. While undoubtedly one would've made the connection regardless, the original title in the enchantingly engrossing, lengthy miniseries that comprises the two-film Masterpiece Theatre Cranford: The Collection is particularly reminiscent of Jane Austen given the fact that the release date of the set coincides with the February 9 street-date for BBC and PBS's sunny collaboration of Emma starring Romola Garai. 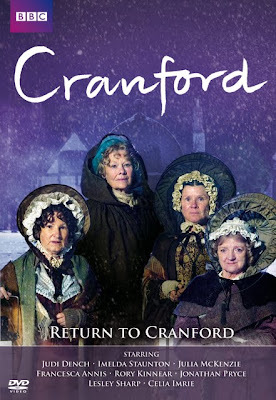 Yet Cranford's female centric narrative that leads viewers into the heart of the eponymous and even-by-1840s standards old-fashioned British township also hearkens back to the darker realities of Charlotte Bronte's Jane Eyre and will also appeal to those who cherished Louisa May Alcott's Little Women and Lucy Maud Montgomery's Anne of Green Gables series. Starring Judi Dench and Eileen Atkins in richly complex portrayals of the surface level sweet and sour sisters of Matilda “Matty” and Deborah Jenkyns respectively, we quickly ascertain that-- much like our first impressions of their roles as merely two of several seemingly stereotypical little old ladies who run Cranford-- there's an unfathomable amount about the actresses, the characters, and the plot left to surprise us as it continues. Just like contemporary Stars Hollow, Connecticut seemed like an immediately inviting, eccentric community on television's underrated Warner Brothers series Gilmore Girls, the fictitious Cranford is filled with residents who are always aware of the business of others, do not take to change very well, and fill their time with gossip, speculation, and of course, being there for one another whether it's in celebration or in times of bereavement. Since change and gossip causes the most fun in both upsetting the status quo as well as providing the women of Cranford with the most entertaining form of plot, both installments are at their best when we're introduced to new visitors who arrive to shake things up, return from the past, or try to make a fresh start. Such is the case many times over throughout the series, especially near the beginning wherein a number of new faces mingle with the old ones, despite the fact that they're all new to viewers, which assuredly makes us feel far more invested in their emotional journey than we would've had we just been given access to their sitting rooms if nothing had been altered. For the strict Deborah and her younger sister Matty, their young acquaintance Mary Smith (Lisa Dillon) arrives to escape her stepmother's endless attempts to marry her off in the hopes of not just reconnecting with the women she holds dear but also get in touch with the community in which her mother had resided. While Mary quickly acclimates to their customs of only lighting two candles at night and allowing just fifteen minutes for visitors only between Deborah's choice calling hours of twelve and three, the Jenkyns are in for another surprise when they receive a new neighbor. Guilty of possessing “common” taste when his quarter of an hour visit reveals the his favorite author and novel are Charles Dickens and The Pickwick Papers respectively, Captain Brown (Jim Carter) and his two daughters nonetheless make a much smoother transition to Cranford than the talented but radically forward-thinking young doctor, Frank Harrison (Simon Woods). With a fancy London education, experience working around Her Majesty the Queen, along with putting stock in such unorthodox techniques as using ice to bring down fevers and prepare patients and battlefield inspired surgery to save limbs, while his red coat signifies his status as an outsider in a sea of men who wear the proper black, his dashing good looks and sweet nature ultimately make him the most sought after Valentine in all of Cranford. Despite the fact that his heart was captured by the lovely Sophy Hutton (Kimberly Nixon) upon first glance, a handful of Cranford women are assured by gossip and misunderstanding that they're the ones for whom he pines.Meanwhile, wealthy Lady Dutton's manservant Mr. Carter (Life on Mars star Philip Glenister) looks past class based prejudices to take the bright penniless Harry Gregson (Alex Etel) under his wing in the work's Dickensian homage. Although on one hand it can be construed as a comedy of manners and character, at its heart, both Cranford and its Christmas modeled Return sequel which is equal to its predecessor in style and plot stand as captivating classics about missed opportunities, second chances, the intermingling of the past with the present, and the way humans can adapt to anything as long as we have family and or friends in our circle of support. Packaged in a sturdy keepsake hardback book like case, which comes as a nicely unexpected surprise in a sea of flimsy recycle material boxes that place holes in the wrong locations of the case precisely where more plastic should be to protect, The Cranford Collection is also housed in its own outer box and deserves a place alongside the Austen adaptations in your collection. And while they're nowhere near as depressing as some of Dickens' fare, Cranford is more realistic than my favorite Austen by daring to remind us a la Alcott and Bronte that even though they're comprised of ink printed on a page, the characters endeared to us as flesh and blood are mortal as death arrives unexpectedly and swiftly throughout its time-span of a little more than a year, sparing no one from supporting players to the principals. Yet even though, like the passing of Beth in Little Women that still brings tears to my eyes even today, you'll be surprised by some of the turns of events, the success of Cranford is in its ability to make some of the losses quite poetic in terms of what happens to a young character in the second film, along with its refusal to abandon humor, warmth and heart even at the most unexpected of times when just two of the Jenkyns' candles prove to go a long way. Based on Gaskell's Cranford, My Lady Ludlow and Mr. Harrison's Confessions, it's a grand achievement to blend all of the source material together for a cohesive miniseries that never feels too episodic. Additionally, the acclaimed, award-winning series makes us want to set down the more popular British fare of Austen and Dickens for a moment to pick up some of Elizabeth Gaskell's work now that we've been exposed to it by the BBC, PBS and Warner Brothers. And of course, this wish goes hand in hand with imagining what it would've been like if the Dashwoods, the Bennets, and the Jenkyns sisters had somehow transcended time, space, and reality to share at least a quarter of an hour together from twelve to three in the afternoon.